China’s overreaction to THAAD misses the key point of the deployment. Beijing continues to levy economic “punishment” against Seoul for its decision to host the U.S. Terminal High Altitude Area Defense (THAAD) system in South Korea. Only a few weeks ago, China banned all package tours to South Korea; none of them have been departing for South Korea since March 15. At the moment, Chinese authorities are targeting — if not bullying — South Korea’s Lotte Group, which owns numerous retail stores across China. Up until now, more than 20 Lotte retail stores have faced closures after so-called “inspections.” Despite constant warnings from China, Lotte had signed a land swap deal with the South Korean government at the end of February — thereby speeding up the process of THAAD installation. Against this backdrop, the first components of THAAD arrived in South Korea. How exactly does the THAAD system undermine Chinese security? Unfortunately, China has never provided a clear answer to this question, but many experts agree that Beijing fears THAAD’s X-band radar the most, along with the possibility of an increased missile defense cooperation among the U.S. and its allies. In Beijing’s eyes, the X-band radar could jeopardize the credibility of its second-strike capability by reaching deep into Chinese territory. (China has a no-first-use nuclear policy.) Concomitantly, China remains quite wary of the development of a U.S.-Japan-South Korea trilateral military alliance that could emerge from Seoul’s eventual integration into the U.S.-led missile defense system. The formation of such an alliance would be a nightmare for China as it would beef up Washington’s encirclement strategy. Experts are divided in their opinions of the effectiveness of the THAAD system. 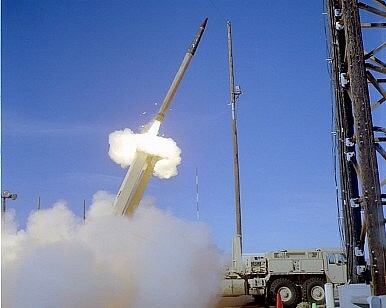 According to Theodore Postol, professor emeritus of science, technology, and national security policy at the Massachusetts Institute of Technology, THAAD’s contribution to South Korean defenses will be minimal at best. Instead, Postol argues that will actually hurt South Korean security. The THAAD system cannot distinguish a warhead from any decoys that might accompany it. Therefore, it can be countered “by simply cutting ballistic missile into pieces after the missile has completed its powered flight.” Postol points out that China and North Korea have the capability to do just that. The THAAD deployment will only exacerbate the regional security dilemma by triggering commensurate Chinese and North Korean military responses. On the other hand, THAAD’s limitations also should make it less of a concern for China. Bruce Klingner, a senior research fellow for Northeast Asia at the Heritage Foundation’s Asian Studies Center, argues that THAAD cannot “intercept Chinese intercontinental ballistic missiles (ICBMs) launched against the United States” due to its design and positioning. Besides, South Korea will remain vulnerable to China’s short-range ballistic missiles (SRBMs) and medium-range ballistic missiles (MRBMs). Klingner concludes that the Chinese fear is overstated and, more importantly, Beijing should acknowledge Seoul’s sovereign right to defend itself. It appears that China has completely overlooked two important factors from the whole THAAD imbroglio. First, South Korea is not a “vassal state,” but an independent, sovereign state. The bottom line is that Beijing should not meddle in Seoul’s internal affairs; as a sovereign nation, South Korea has the right to exist and an obligation to protect its citizens, regardless of THAAD’s effectiveness. Second, China’s own policy toward North Korea played a key role in bringing about South Korea’s decision to host the THAAD system. Pyongyang’s rapidly advancing nuclear and ballistic missile capabilities undermine Seoul’s security. Already this month, North Korea has test-launched four ballistic missiles on March 6 and attempted another test on March 22. Moreover, two implications could be drawn from China’s response to THAAD. First, the role of nationalism in Chinese domestic politics and foreign policy will only increase over time. If not managed properly, it could not only spin out of control, but also lead to unintended consequences; simply put, it’s a double-edged sword. Second, in order to get what it wants, Beijing will continue to rely on the use of economic coercion. However, Chinese decision-makers should remember what John Mearsheimer — arguably the father of “offensive realism ” — said in his book, The Tragedy of Great Power Politics: “If you do not survive, you cannot prosper.” At the end of the day, security interests trump economic ones; Beijing cannot succeed in using economic tools to make its neighbors forfeit their own security. The THAAD issue is certainly complicated and there is no clear resolution. As Seong-hyon Lee, a research fellow at the Sejong Institute, notes, Seoul should get ready for “a long, winding, bumpy ride.” Scoring a moral victory will be not enough for South Korea. It’s time for the country to devise a blueprint for reducing its heavy economic dependence on China. Yu Bin Kim is an assistant professor at the Republic of Korea Naval Academy. The views expressed are his own and do not necessarily reflect the views of the Republic of Korea Navy. He tweets at @Yubs89. What enables poverty-stricken North Korea to pursue SLBM technology? In a word: China.